Bee flies are great mimics of bumble bees and some have colorations that look similar to large honey bees. They have large, compound fly eyes, have long conspicuous mouth parts that form an extended beak, and the mature adults generally like to hover over a nectar bearing flower and extract the nectar without landing. My son is fond of calling them “elephant nosed bees” because of their long proboscis. We have often seen them methodically working on Mexican Bird of Paradise flowers in the late spring and summer months. 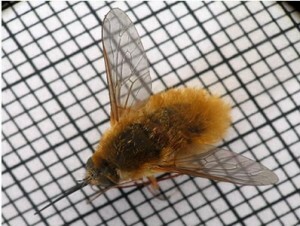 Bee Flies have hairy bodies and long, slender legs. Adult bee flies drink nectar, but their larvae are parasites of beetle larvae as well as the brood of solitary wasps and bees and other burrow-nesting insects. Commonly, they lay their eggs near the entrance to the nest of the specific host to be parasitized by that species of bee fly. The tiny larvae enter the nest and usually wait until the host larva has pupated before feeding on the target hosts brood. Bee flies do not sting and are not aggressive. Bee flies are solitary insects and because of their value as minor pollinators, we do not recommend any form of control. Hover flies are a very large diverse species of flower loving flies that feed on nectar, pollinate garden flowers, and in many species, have larvae that are voracious aphid eaters. Some adult species go further by harvesting the sweet secretions that aphids exude. 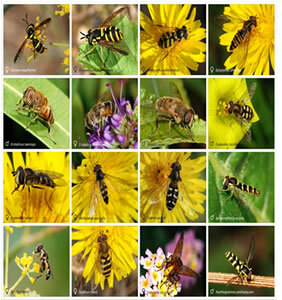 Hover flies are mimics of honey bees and wasps and can look very similar to both. Generally, they are smaller, have definite large fly like eyes, can hover for extended periods of time over a food source and easily fly backwards and forwards unlike many other pollinating insects. They are not aggressive, cannot sting and are usually welcomed by many gardeners as a natural source of aphid control. There are too many species to list, however, a few species that look like honey bees (commonly called drone flies) are Eristalis: pertinax, interruptus and tenax. Common species that mimic wasps are: Eupeodes corollae, Chysotoxum festivum and Xanthogramma pedissequum. 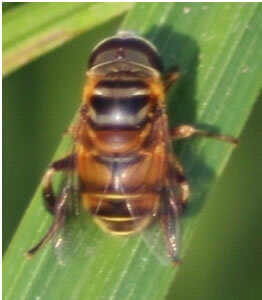 Hover flies are solitary and because of their value to gardens we do not recommend any form of control.